Heavenly smell of garlic pizza! Just like dosa batter my search for perfect pizza was a self research first. From storing several pizza joints sachets of oregano etc to extra virgin olive oil.You name it and I have my own stories to explain my failed attempts. 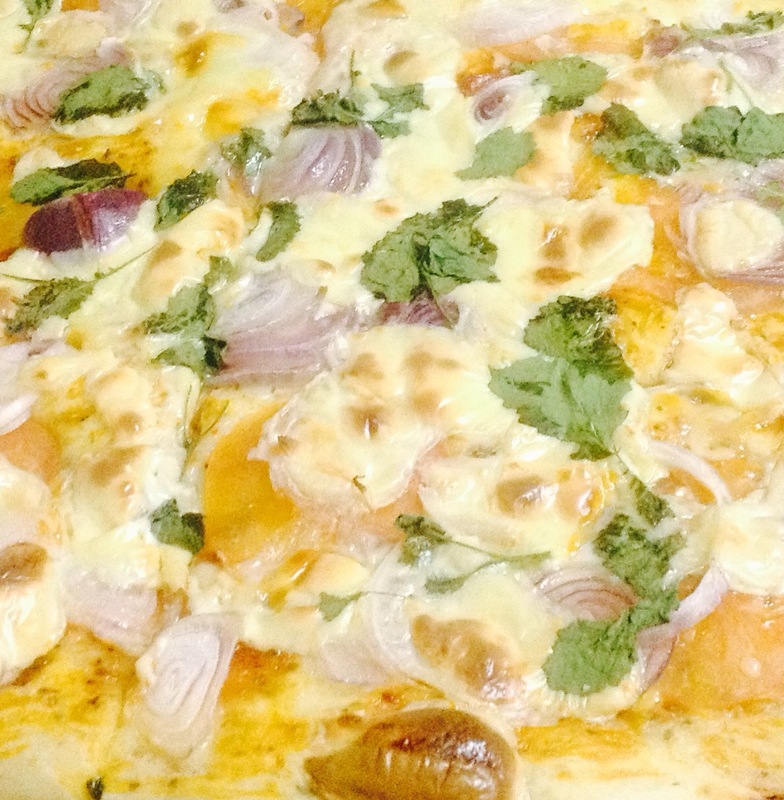 But finally one day I ended in making perfect spongy n crusty brown pizza and my kids were like “oh my God Mummy”. Since than I kept this recipe my favorite to make my bestest best pizza for my kids. 1- Mix All purpose flour(maida) with dry yeast first than mix in salt in a big bowl. 2- Mix water-milk mix, honey, egg, minced garlic and olive oil together very well. 3- Now mix it with dry mix of flour yeast and salt. 4- Mix it with spatulla for a while. keep this Into fridge for 4-6 hours. 1- Take a big baking tray and dust it with all purpose flour. 2- Take out the bowl of pizza dough and with the help of patula mix it again very well. 3- Pour the pizza dough on the dusted baking tray and spread in all corner equally. 4- Preheat oven for 10 minutes and switch it off. 5- Keep this pizza base tray in preheated oven for half hour. 1- Take out the pizza base tray. 2- Mix tomato sauce and oregano powder together. 3- Brush the olive oil on the pizza base very well. 4- Brush the tomato sauce over this very well. 5- Place tomato slices n onion slices all over the pizza. 6- Now start crushing the cheese slices and spreading over it. 7- Sprinkle little olive oil over it. Than red chilli flakes too. 1- Place the tray in oven at 200 degrees at the lowest rack for 15 minutes. 2- Than bake it at 180 degrees at middle rack for 20-25 minutes till golden brown. Discussing the happy (perfect)dosa batter! How to avoid foreign hotels booking hassles!